After taking a break to Do Science, I am back to looking for nifty things lying around. I have found another strange object. I do not know what it is. 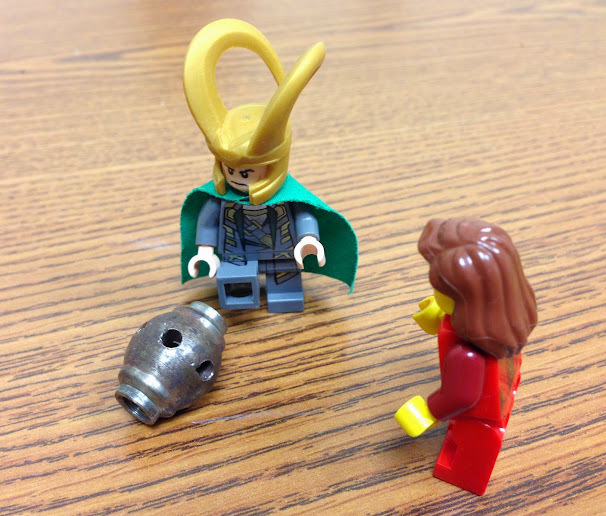 The human female says it is "a teeny, tiny Lego Loki Thighmaster" and that I need to lay off the in-between-meal snacks. Still not a lot visitors to the Plant Geek tent. I am bored with crayons and checklists and flowers. More than ready to go home, even if the human female is still yammering and playing with the art supplies. Sigyn, perhaps we should take a little walk down the trail and see if there is anything interesting at the other exhibits. Which would you rather, mammals or insects? Very well, furry it is. Oh, wait! It looks like the Herpetology tent has come to visit us! 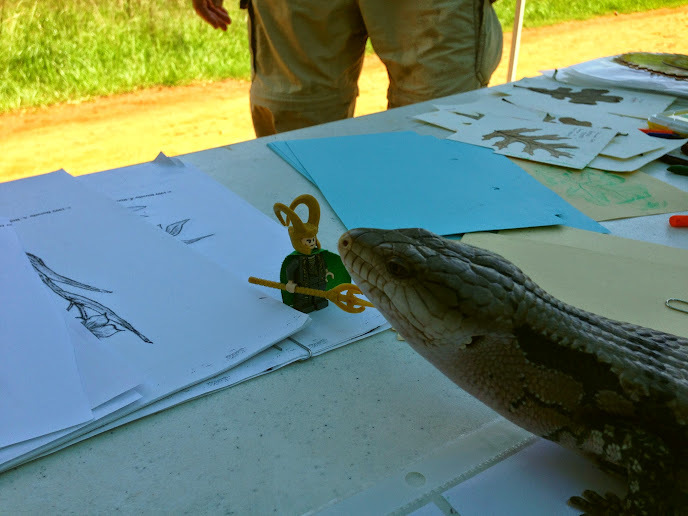 The human female says this is an Ambassador Animal, someone’s pet that visitors can touch, and that it is something called a “blue-tongued stink.” I don’t smell anything, but the tongue sounds interesting. Open wide, lizard, and let’s have a look! Um, this beast is now a bit too close for comfort. Pet or not, I must summon Gungnir and make sure Sigyn is safe. Stop, beast! That is far enough! I should have known. My sweetie sure does have a way with animals! What?! Ehehehehehe! The naughty stink has…peed on the humans! Oh, ehehehehehehe! Well done! Not bored anymore!! Didn’t we do this already? Part III: Bored now. So the Biology Nerds in the Woods Festival is now open. The Plant Team’s table is all set up. Let the crowds come! Here come some— No. Sorry! Just more volunteers. Well, well, well. It appears that the humans have done a monumental amount of work for a pitiful turnout from the public. Before you ask, no, I’m sure the fact that I helped various organizations schedule a dozen other events going on all over town today has nothing to do with it. Now we must amuse ourselves while we wait for visitors to show up. Sigyn is playing with the hand lens. Ehehehehe! You look funny! My turn! Human, hold the lens and let me try. That was fun! What else can we do? I see we have crayons. Crayons are acceptable. Last year I made a pink leaf rubbing. Green. I need green. Green is better. The human female, though extremely sloppy about most things, is very “sensitive to color.” She is completely unable to resist the urge to herd the box of mixed up crayons into some semblance of spectral conformity. It’s a sickness. Still, I must admit that the green ones do look best all grouped together. Sigyn, of course, prefers the other end of the lineup. Now that she is back at the plant tent, I shall help with that. Let me improve her list. She came back from her survey with this grass that Sigyn likes. 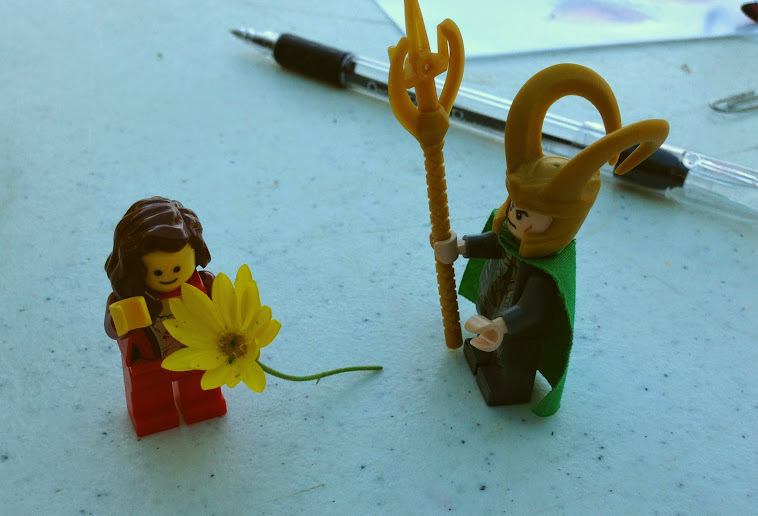 Sigyn found this pretty little flower. She says it looks like little orchids. If I knew what an orchid looks like, I might agree. She has also found this yellow daisyish flower. There were aphids in that. Not sure how? There’s this. Sometimes it is brought home to me just how paltry is my progress in subjugating this planet. 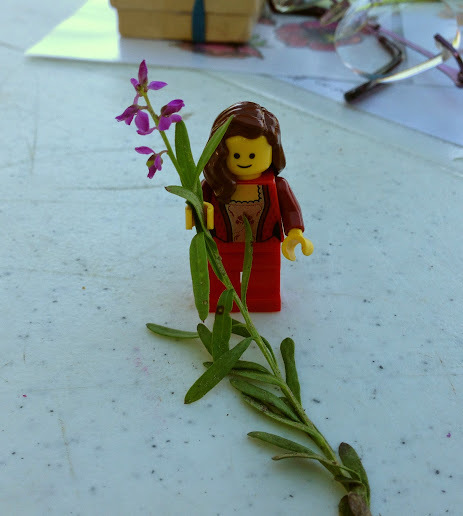 Can it be a year already since the last time the human female dragged herself, Sigyn, me, and literal bucketsful of supplies out to the wood for the annual Biology Nerds in the Woods Festival, or whatever it’s called? Here we are again, some of us protesting volubly. Apparently there is a lot of preparation necessary. For the human female and her cohorts, that means planning and working up activities for the younglings and coordinating the volunteers. The woods need to be tidied and, I don’t know, the animals combed, and the bugs polished, or something. Here. Have a picture of a wet plant. Don’t ask me what its name is. I don’t care. 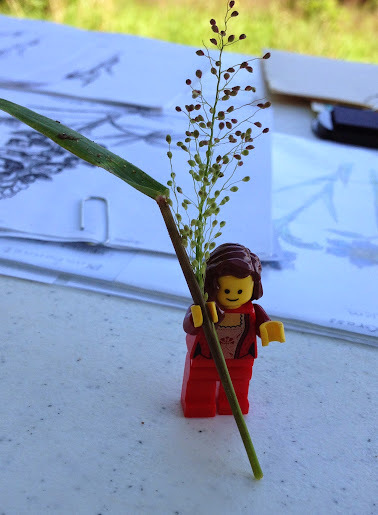 The human female plans to lay out a self-guided plant trail, labeling the wildflowers and trees with their common and sciencey names. Sigyn has leapt to help her. It will take them hours to place hundreds of painstakingly handwritten flags. It will take me about thirty seconds to swap all the names around once they’re done. “Bluebonnets” will go on the red flowers, and the “Stop and smell the sweet clover” will go on the nettles. The “Come this way” flag is going to lead all the visitors through the deepest puddle I can find. I’ve also arranged for a prodigious hatching of mosquitoes and sweat-flies. Let the good times begin! Found Objects, Part I: It’s a….thing. Sigyn and I are out for a stroll, just– Oh. What is this? Sigyn doesn’t know, either. I think, though, that it has the look of something that would make a very nice bomb. Next time the human female makes gravy, this is going in the bottom of the pot. 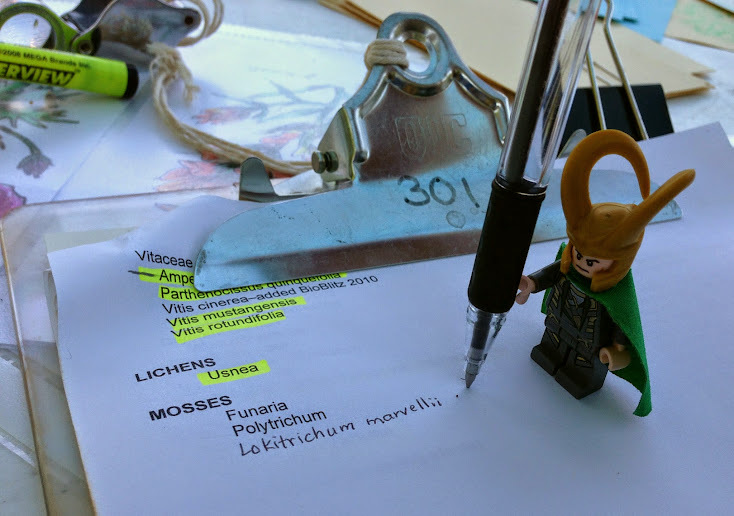 Sigyn, what is that you’ve found? Hmm. I believe it is some sort of paper clip, but I agree! It does look as if it is smiling!